It’s officially fall and the best way to celebrate is with these Pumpkin Oatmeal Cookies. Ridiculously soft and perfectly pumpkin-y. **Update: the photos and text within this post have been updated since its original posting in 2013. No changes have been made to the recipe. I hope that you all feel as strongly about pumpkin as I do. I’m not condoning PSL’s over here, I’ve never been a fan, but I am down with pretty much any pumpkin baked good. Pumpkin pancakes, pumpkin donuts, pumpkin bread, pumpkin muffins. I want it all. But these cookies?! They are at the top of the list. They are what I most look forward to when fall rolls around. 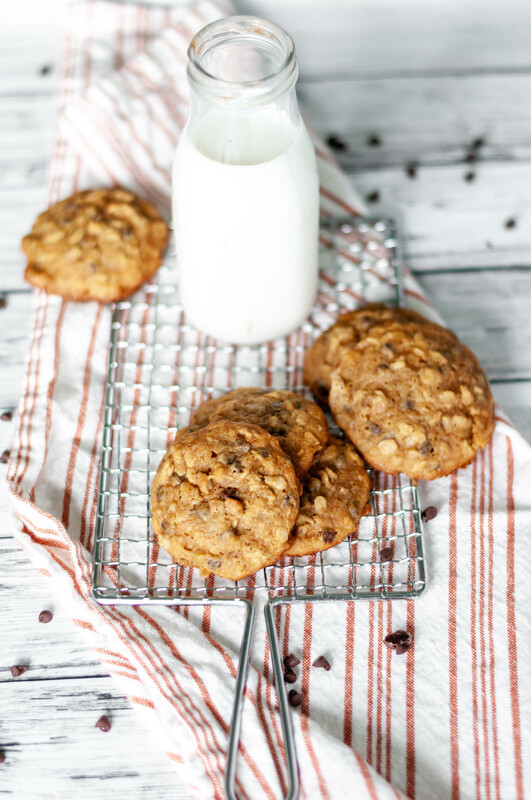 These pumpkin oatmeal cookies are a family favorite from way back. We’re talking cookies that warm, fuzzy childhood memories are made of. The recipe comes from my mom’s best friend (along with the best sugar cookies in all the land) and it just doesn’t feel like fall without them. We made them every fall without fail and sometimes at other times of the year. We’re in a no judgement zone here, ok? We are totally the eat pumpkin in April kind of family and I don’t care who knows it. NO SHAME. These cookies aren’t just any ordinary pumpkin cookie. They are packed with all the flavors and textures. You can just tell by looking at them that they are soft and fluffy. They don’t have that chewiness that a lot of cookies have but rather a fluffy alllmost cake like texture. I can’t quite describe it but trust me, it’s perfect. Oats and toasted pecans bring texture and crunch to the cookies. The mini chocolate chips bring richness and the cinnamon and pumpkin fulfill that warm fall flavor. They are one of my favorite cookies of all time. I don’t discriminate against cookies either so that’s saying something. Something to note about these, they are so soft and moist (sorry) that will stick together terribly if they are touching. Make sure if you’re layering them in your storage container to use parchment or wax paper between each layer. And don’t overlap them either. They’ll turn into one massive cookie situation if you don’t listen to me, I know from experience my friends. They still got eaten but it was a little weird. If you haven’t quite gotten those fall vibes going make these cookies and they’ll take you there. If you’re already in full fall bliss, I’m with you sister and still MAKE THE COOKIES for maximum fall impact. Preheat oven to 350 degrees F. Cream butter and sugars together until light and fluffy, about 5 minutes. Meanwhile, in a medium bowl combine flour, quick oats, baking soda, cinnamon and salt. Set aside. Add eggs and vanilla to creamed mixture, mix well. 3. Alternate adding dry ingredients and pumpkin until thoroughly combined. Stir in chocolate chips and pecans. Drop onto greased cookie sheet and bake for 10-15 minutes. These cookies look and sounds so delicious! Thanks Natalie! They are one of our favorites.